In last year’s round of the Enabling Technologies Hotels programme of ZonMw/ NWO-ALW almost 50 percent of the grant applications have been awarded: 32 projects out of the 65 submitted proposals. This high percentage of granted projects was made possible by an increase of the call budget from € 750.000 to € 930.000. The full list of projects awarded can be found here. For the first time “booster” projects could be submitted in the call. These are public-private projects aimed at generating hypothesis-supporting preliminary data, to be used in large national or international (e.g. Horizon2020) grant applications, which increasingly require this type of evidence for grant applications to be successful. Another novelty this year was the inclusion of data stewardship as a selection criterion in the call, which meant that applicants were asked to write a data stewardship section as part of their proposal. The requested data stewardship section is part of the ZonMw pilot project concerning tools to promote “Access to Data”. Experts of DTL were asked to evaluate the data stewardship section. The main goal of the Enabling Technologies Hotels programme is to provide wider access for researchers in the Netherlands to high-end technologies and the connected expertise and infrastructure. This a called the “Hotel” concept. Researchers (“guests”) that have no access to high- end technological facilities, can ask funding for accessing a service-oriented research facility (“hotel”). Researchers can request access to all “Technology Hotels” of DTL. 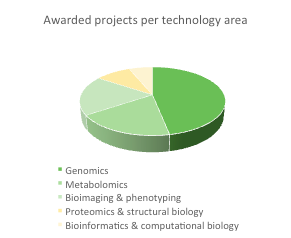 Bioinformatics, Computational and Systems Biology: 2 projects awarded. Genomics (incl. Next Generation Sequencing approaches): 15 projects awarded. Proteomics & Structural Biology: 3 projects awarded. Bioimaging & Phenotyping (incl. Advanced Microscopy and Medical Imaging): 6 projects awarded. This entry was posted in Technologies.